The Old Town is located in the heart of the city. The most iconic places of interest and sights and the main shopping and entertainment areas are just a short walk away. 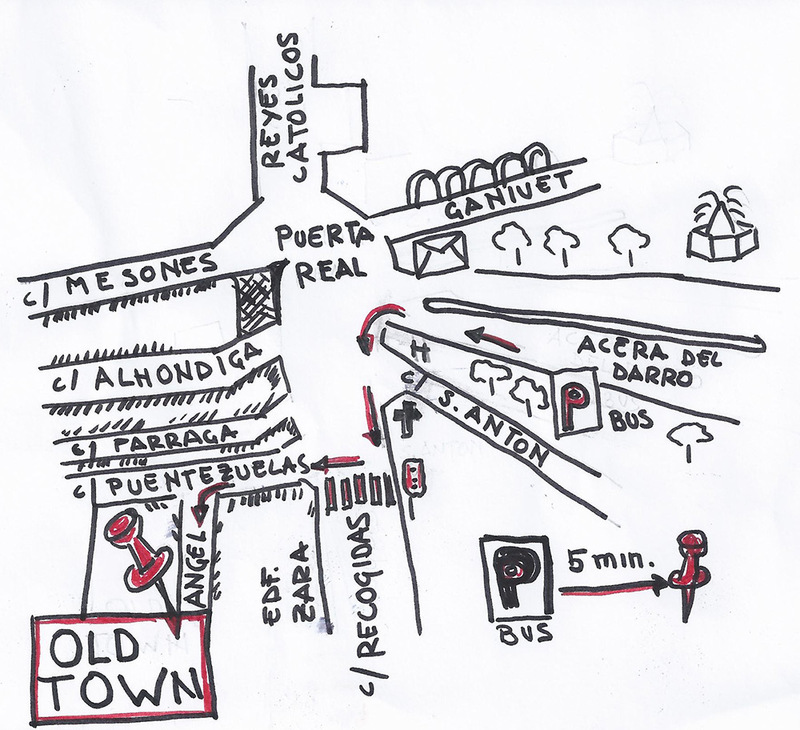 Bus station: Take bus SN1 or SN2 and get off at the corner between Camino de Ronda and Recogidas . The journey takes about 15 minutes (1.20 €). From stop Camino de Ronda with Recogidas, you’re 5 minutes from the hostel. Follow the street to the Hotel Los Patos, turn left and the first street on the right is the Angel Street. Train station: Take the bus LAC, get off at Puerta Real-Acera del Darro. Airport: Take the bus to Granada Center, 40 minutes drive (3 €) and get off at Puerta Real-Acera del Darro. Taxi 25 minutes (35-45 €). From stop Puerta Real you’re 3 minutes from the Hostel. Follow Acera del Darro walking away from the “fountain de la Batallas” on your right, turn left when you see Hotel Victoria onto Recogidas street and cross the traffic light. Turn into the first street on the right, Puentezuelas street and the first street on the left is the Angel Street.